Nomad doesn’t tend to do ordinary when designing recipes for their beers but, even by their standards, adding a few buckets of seawater to a beer seems a little out there. But there’s method to the madness here as they’ve tried to capture the essence of the Northern Beaches in a glass by brewing a Gose, the somewhat obscure style of beer originating from the German town of Goslar which counts salted water amongst its ingredients. Nomad’s saltwater came straight from Freshwater Beach, just down the road from the brewery, but other than that they’ve aimed for a fairly faithful interpretation of the style, using pale and wheat malts, Willamette hops and a German ale yeast. 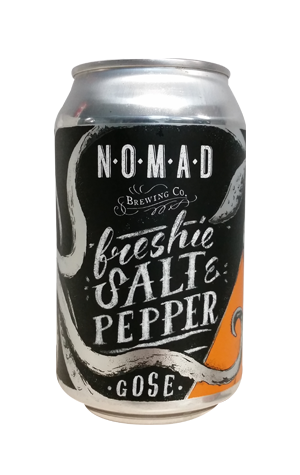 The classic Gose recipe calls for coriander, which they’ve added, but Nomad have given their version an extra local touch by also including Tasmanian mountain pepper. The resulting beer is something along the lines of what the name suggests: salty, spicy and ultimately refreshing. It's also become the brewery's surprise hit, becoming a firm favourite not only on the Northern Beaches by increasingly abroad where it's exported at Nomad's flagship ale.